Update 2 May, 2016: The Nostalrius team have made an official announcement regarding an upcoming meeting with Blizzard. In the forum post, the Nostalrius team seem hopeful that Blizzard will implement legacy servers, following a petition campaign that managed to top 250,000 signatures. In the wake of this, and after seeing how important this all seems to be for a large portion of WoW fans, the team say they now see themselves as “ambassadors of a larger movement for the entire World of Warcraft community that wants to see game history restored”. “Our top-priority and only focus now”, they add, “is to fulfill the needs of this community, by carrying your voice to Blizzard directly”. This will happen in the form of a meeting, which is taking place soon, though no date has been revealed. However, the Nostralius team say they’ll have another announcement next week. Read the full post here. Original Story 26 April, 2016: A mega popular pirate vanilla World of Warcraft server recently got sent warning from Blizzard’s legal team and was forced to shut down. 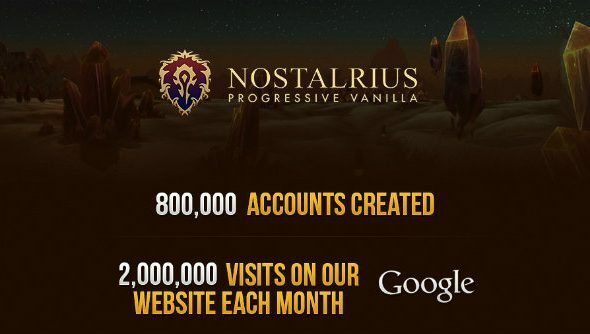 Nostalrius, as it’s called, had been operating as a non-profit service for over a year before the ban was enforced. For now, you’ll have to play one of our list of PC’s best MMORPGs instead. There was an outcry from the WoW community after the news broke, as many players prefer to play WoW back when it was simpler, with Nostalrius boasting a 60 level cap and a lack of modern systems. It was WoW in a time capsule. Blizzard have been silent on the issue, despite the forums being ablaze with chat, but now they’ve finally broken that silence with a post to the WoW community. “Our silence on this subject definitely doesn’t reflect our level of engagement and passion around this topic,” says a WoW community manager in the post. “We hear you. Many of us across Blizzard and the WoW Dev team have been passionate players ever since classic WoW. In fact, I personally work at Blizzard because of my love for classic WoW. The community manager goes on to explain that Blizzard were forced to take action to the pirate server, as it was in infringement on Blizzard’s rights – these things can’t be seen to go unchallenged. Blizzard did look into granting an operating license to the server, but “there is not a clear legal path” to do that while protecting Blizzard’s IP. “If we could push a button and all of this would be created, we would,” continues the community manager. “However, there are tremendous operational challenges to integrating classic servers, not to mention the ongoing support of multiple live versions for every aspect of WoW. “So what can we do to capture that nostalgia of when WoW first launched? Over the years we have talked about a “pristine realm”. In essence that would turn off all leveling acceleration including character transfers, heirloom gear, character boosts, Recruit-A-Friend bonuses, WoW Token, and access to cross realm zones, as well as group finder. We aren’t sure whether this version of a clean slate is something that would appeal to the community and it’s still an open topic of discussion. So it seems like Blizzard are trying to find a way to please everybody, but it’s a legally complex and difficult to pull off move. It’s good to hear they are exploring options, though. Perhaps the people running Nostalrius will end up working for Blizzard on something. Either way, it’ll be interesting to see what comes of this, and it’s good to know Blizzard are listening to the fans.